Hoping to get recent and updated list of car price in Nepal? Your are in right place. Lot of us look for cars or auto price in Nepal. However, there aren’t much reliable source where we can get this information, particularly for four-wheeler. Therefore, for your ease, we have come up with price list of various models & brands of cars including SUV, pickups, sedans etc. Now know the cost information of various models from any brands of car in Nepal, beforehand you go to the showroom to buy. Check our price list below for more details. Cars are available in various body type. This includes sedan, hatchback, compact SUV, SUV, pickup, etc. Depending on your need and taste, you can buy these type of cars from various brands in Nepal. There are over 20 car companies selling their vehicles in Nepal. 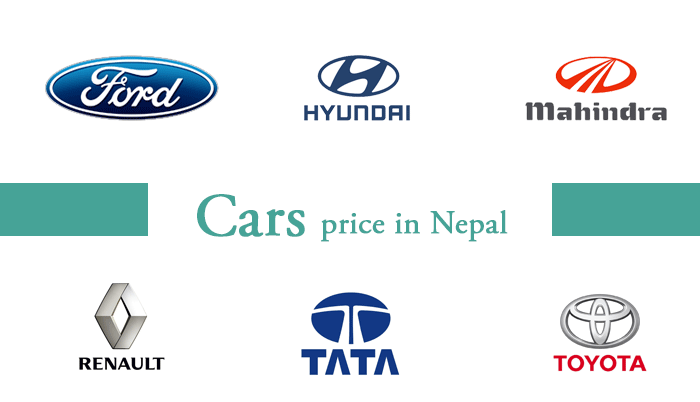 However, it is not possible to list out price of each and every brands of car in Nepal. Therefore, we are presenting you some of the popular brands such as Ford, Hyundai, Mahindra, Renault, Tata and Toyota. To check the price-list of other brands, you may look at our sidebar menu. For full showroom MRP information on all variants and models of Ford cars or pickup, check price list at Ford Nepal or contact Go Automobiles Private Limited, their official sole distributor. For full showroom MRP information on all variants and models of Honda cars or SUV, check price list at Honda Nepal or contact Syakar Trading Company Private Limited, their sole authorized distributor. For full showroom MRP information on more variants and models of Hyundai Cars, check price list at Hyundai Nepal or contact Laxmi Intercontinental Privated Limited, their sole authorized distributor. For full showroom MRP information on more variants and models of Mahindra cars or vehicles, check price list at Mahindra Nepal or contact Agni Incorporated Private Limited. For more and complete details on Maruti Suzuki car price in Nepal, specifications or contact information, you may check list at this page of Maruti Suzuki Nepal or contact CG Motocorp, their sole distributor. For full showroom MRP information on more variants and models of Renault car, check price list at Renault Nepal or contact their sole authorized distributor – Advanced Automobiles Private Limited. For full showroom MRP information on more variants and models of Tata Cars or pickup, check price list at Tata Motors Nepal or their sole authorized distributor – Sipradi Trading Private Limited. For full showroom MRP information on more variants and models of Toyota cars or pickup, check price list at Toyota Nepal or contact their sole authorized distributor – United Traders Syndicate Private Limited (UTS). Datsun car price in Nepal (2019) – Pioneer Motocorp Pvt. Ltd.
Isuzu pickup and car price in Nepal (2019) – Continental Trading Enterprises Pvt. Ltd.
Kia car price in Nepal (2019) – Continental Trading Enterprises Pvt. Ltd.
Mitsubishi car price in Nepal (2019)- Leon Motors Pvt. Ltd.
Nissan car price in Nepal (2019) – Pioneer Motocorp Pvt. Ltd.
Peugeot car price in Nepal (2019) – Shangrila Motors Pvt. Ltd.
Skoda car price in Nepal (2019) – MAW Enterprises Pvt. Ltd.
Volkswagen car price in Nepal (2019) – Pooja International Nepal Pvt. Ltd.
Land Rover price in Nepal – Kishore Gears Pvt. Ltd.
Mercedes Benz price in Nepal – Deepak Gautam & Company Pvt. Ltd.
*Please note that all above price is subjected to change and is for reference purpose only. Kindly contact respective showroom, dealers or distributors to get the latest price. Hope you liked our page of car price in Nepal. You can find useful information about all other brands of cars here in New Cars section. You can contact these brands and find more details on price, specifications or features.